This variety is early and prolific. 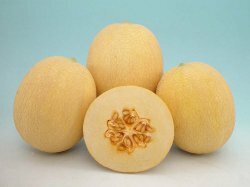 Fruit is round with light yellow skin. weighing about 1.5 - 2 kg. Fruit can be harvested 40 days after flowering. Flesh is white, tender & very sweet with aroma & unique taste.